Reading A440 Trophy – 2019 Winner announced! 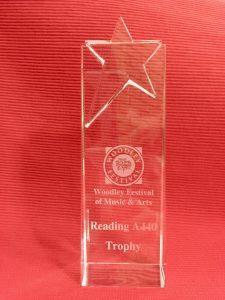 The Choir are delighted to announce the winner of the Reading A440 Trophy for most promising young musician at the Woodley Music Festival. James Weir, saxophonist, and his accompanist Alexandra Isaacs were judged joint winners at this year’s festival. We very much look forward to performing with them in an A440 concert soon. As a choir we think it’s important to support young musical talent in the area and are excited to create this opportunity to perform with the trophy winner. Watch this space for updates! Reading A440 Choir will be awarding this trophy annually to a promising musician at the Woodley Music Festival. A talented musician of secondary school age will be selected from across Vocal, Instrumental and Piano entries. The trophy will be awarded at the festival concert on the 31st of March, 2019. The winner will then be invited to perform in a concert with A440 choir, receiving a fee of £50. Would you like to support A440 and enjoy these great benefits? All for £10 per person per annum! We’d love to welcome you to our group of special friends. Simply email Rosie Morris, Friends’ Scheme Secretary choralworld@gmail.com for more information. 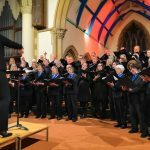 Reading A440 and the Canbury Singers enjoyed sharing the stage at All Saints Church, Wokingham on Saturday 2nd March. Our lovely audience was treated to a wonderful and varied concert. The programme included I Will Lift Mine Eyes (Jake Runestad) and I was Glad (C Hubert H Parry) sung as joint choir items. 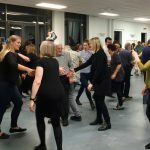 Following this choral feast, we continued the evening fun by dancing the night away to the Craigievar Ceilidh band. The event ended with a delicious fish and chip supper that was enjoyed by all. It was lovely making new friends and we look forward to meeting again in August for a very special event! More news on that to follow!